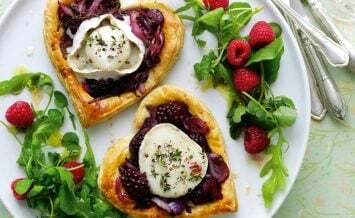 Welcome summer with this delicious, light and fresh blackberry and goat’s cheese quiche recipe. It takes just 15 minutes to prep the dish and is perfect served up for dinner with a side salad and as easy leftovers for lunch. 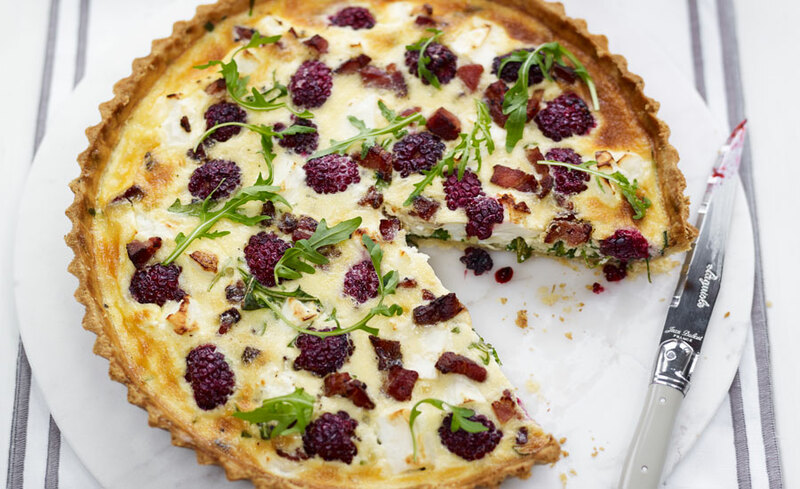 The goat’s cheese, rocket, bacon and blackberry filling all come together beautifully to offer a sophisticated spin on the classic quiche. To make the pastry place the flour, sugar, salt and rosemary into the bowl of a food processor and pulse to combine. Add the butter and pulse until the mixture resembles coarse breadcrumbs, the odd bigger chunk of butter is fine. Add the water and pulse until the pastry forms a ball. Tip the pastry out and use your hands to gently bring together into a uniform dough. Wrap in Clingfilm and refrigerate for an hour before using. Roll the pastry on a lightly floured work surface until about 2-3mm thick. Use the pastry to line a loose bottomed tart tin, 9 inches in diameter, trimming off any excess. Refrigerate the tart case from an hour before baking. Line the chilled pastry base with a crumpled piece of parchment paper and fill with baking beans or rice and bake for 25 minutes at 180c (160c fan oven) before removing the parchment and beans and baking for a further 10-15 minutes or until the pastry is lightly golden. Remove from the oven and brush the pastry case with the egg yolk before baking for a minute or so to set the yolk (this helps create a strong barrier so you don’t get a soggy bottom). 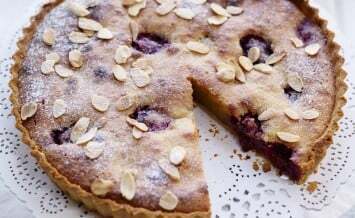 Start filling the pastry case by adding a layer of rocket and then sprinkle over the blackberries, goat’s cheese and bacon. In a bowl whisk together the eggs, milk and cream, seasoning with some black pepper. Carefully pour in the egg mixture and place the quiche onto a baking tray and place into the oven, baking for about 25 minutes at 180c (160c fan oven) or until the egg mixture is set and top is very lightly browned. Allow to cool to room temperature before serving. Cook’s Tip: When filling the quiche keep a few bits of bacon and rocket aside to sprinkle on top of the quiche after the egg mixture has been poured in.